This is not simply a fox, but a mixture of fox and hound. The lovely figure, fuzzy tail and slender snout are all impressive. 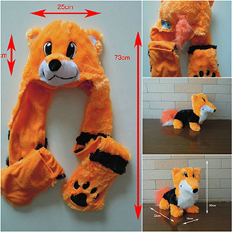 The toy itself is about 8" long, while the hat is around 28" in overall length. long enough to be used as a scarf and mitten. This 3 in 1 fuzzy hat is your perfect choice for children and women in winter. Mini. 50 pcs. by airmail. Ocean shipment is offered for qty. over 1000 pcs..( mixed items allow) Write us to get the quote based on your qty. and shipping method.